Getting Lost in 100 Million B.C. Anyone who knows me personally understands that I’m just a big kid. 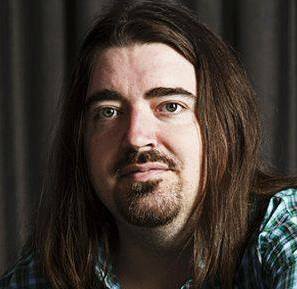 I watch all kinds of cartoons, I play with Lego bricks and Slinkys when I’m stumped on something, and I’m a sucker for dinosaurs. That last thing is pretty much the main motivation behind the design of Escape from 100 Million B.C. 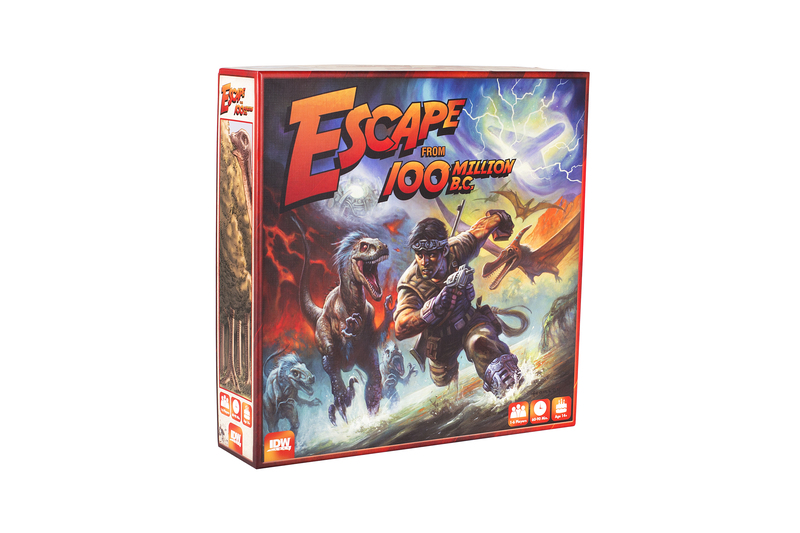 In Escape from 100 Million B.C., players take part in an ill-fated time expedition that gets stranded 100 million years in the past with their time machine perched precariously atop an active volcano. Due to their violent crash landing, most of their equipment and vital parts of the time machine have been scattered across the dinosaur-infested valley that they find themselves in. Worse, as they explore and interfere with the past, they find that they are destabilizing the time stream, causing people and things to be pulled from other time periods into the valley as well. If this continues, it can cause a chain reaction ending with the volcano erupting as a sort of temporal release valve to protect the universe from further damage. In game terms, the players have to explore the map, trying to recover the time machine pieces and their equipment while trying not to kill any of the dinosaurs (which causes paradox). Once they retrieve enough time machine parts, they can time jaunt back to the future, but they have to be careful what sort of gear they leave in the past or they might cause even more paradox, snatching defeat from the jaws of victory at the last second! Sure, it’s an unusual theme, but when I went freelance a few years back, one of my reasons for doing so was so that I could have more control over the kinds of games I design. I wanted to do some quirkier stuff that would allow me to stretch different design muscles than I was used to using. With Escape from 100 Million B.C., I wanted to design an adventure that would be at home in an old pulp magazine next to a Tarzan or Conan story, but to do it in such a way that the story is told in the intersection of the game components, rather than on them. That is to say, the stories are created dynamically by the game engine rather than being mostly written on cards. This means that the way that the map is built for a particular game interacts with where and how the dinosaurs and time castaways appear and move to organically tell a story involving the players. 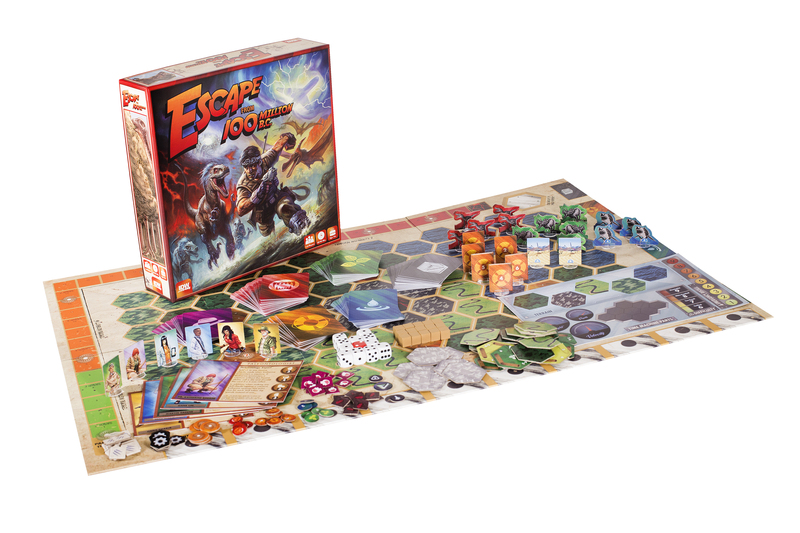 While there’s a bit of card text for unusual events, most of the story takes place in the players’ heads, as the various creatures move around the map and the players fight, rescue, or drive them off. In other words, if the game is a machine, then the story dwells where the gears touch each other. As an example, in one playtest, we were perilously close to having the space-time continuum unravel on us, and after a patch of particularly bad luck, we found ourselves with a time-lost Abraham Lincoln hemmed in by 2 Tyrannosaurus Rexes on either side of him. If Lincoln was attacked and killed by a T-Rex, that was pretty much it for us (and the time stream). We were able to drive off one T-Rex, but inevitably the other one sought out Honest Abe on the very next move, and we all groaned, figuring that was it. However, he was able to miraculously defeat the T-Rex with his trusty axe, and we were just able to return him to his proper time before successfully time jaunting home to the accompaniment of a group cheer. If that’s the sort of story you like experiencing with your game group; if your copy of Sir Arthur Conan Doyle’s The Lost World is ragged from wear; or if you’ve spent hours playing with little plastic dinosaurs, then give Escape from 100 Million B.C. a try. Oh, and make sure you don’t leave any tasty snack cakes in the past – those things are murder on the paradox level. ← IDW Games Returns from GAMA!